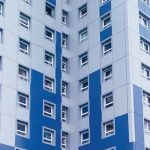 In light of the recent tragic events at Grenfell Tower and speculation regarding the role of the cladding in the rapid spread of the fire we want to reassure clients regarding d+b facades’ system. Our aluminium rainscreen system is +25 years old, unchanged and is proven to perform in all respects, including severe fire. The system utilises only inert, solid aluminium, which has an A1 NON COMBUSTIBLE fire rating with no requirement for fire retardants. The system also incorporates A1 NON COMBUSTIBLE integral mineral wool insulation and firebreaks. Incidents of severe fire have occurred in our completed buildings and the system has met the fire performance requirements in all respects, the fire has not propagated and has been fully and successfully contained. We are currently compiling confirmatory independent fire reports that will follow in due course. PROVEN LONGEVITY WITH DEMONSTRABLE PERFORMANCE IS THE TRUE DETERMINATE WHEN SPECIFYING OVERCLADDING.